I took time a couple of weeks ago to go "want list hunting". That is, I scoured the blogosphere's various want lists to see if I could come up with a potential trade partner. I came across Kyle and the Nolan's Dugout blog and his comprehensive want list. I found about 40 inserts to send him (gladly) and asked him to send back what he thought was fair. Kyle's envelope came today, and as the last trade was a couple of years ago, this was full of Blue Jays. 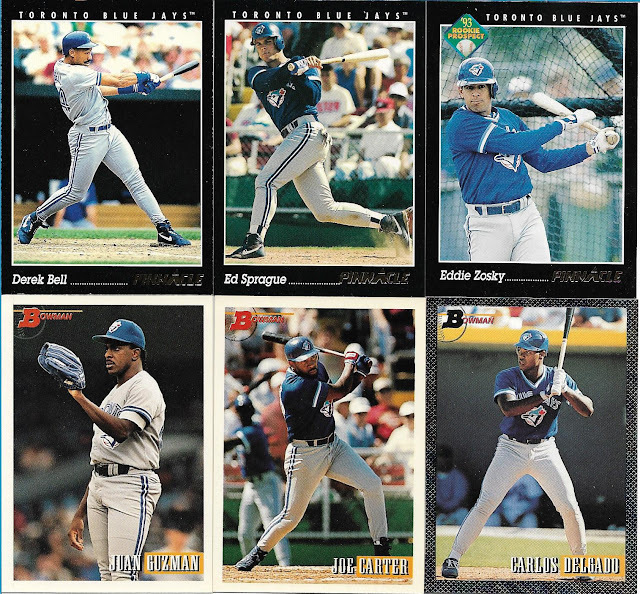 Going through them initially, I saw a lot of cards from the 91-93 era, and I thought to myself "don't I have a lot of these already??" Nope. Just like last trade with Kyle, every card in the envelope was something that could be marked off the want list. It doesn't get any better than that. So now you're probably wondering why the six packs. Well, last night's post contained the number 5, so I figured let's go one higher tonight. 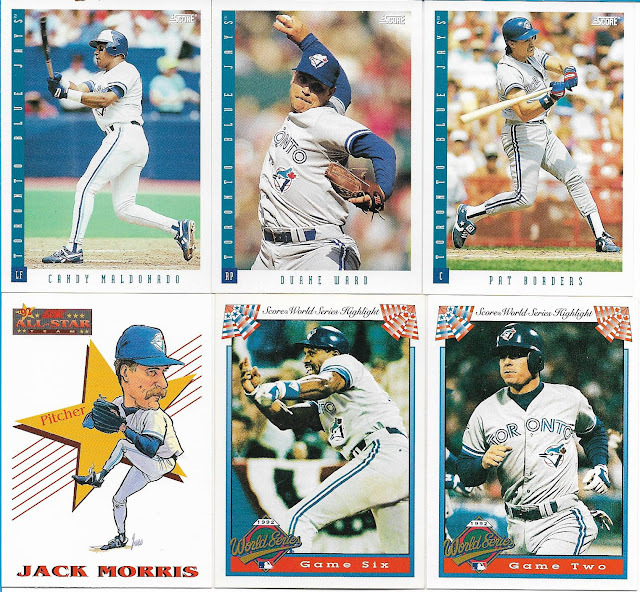 So here's 36 cards from the envelope that I was able to mark off the Blue Jays list. 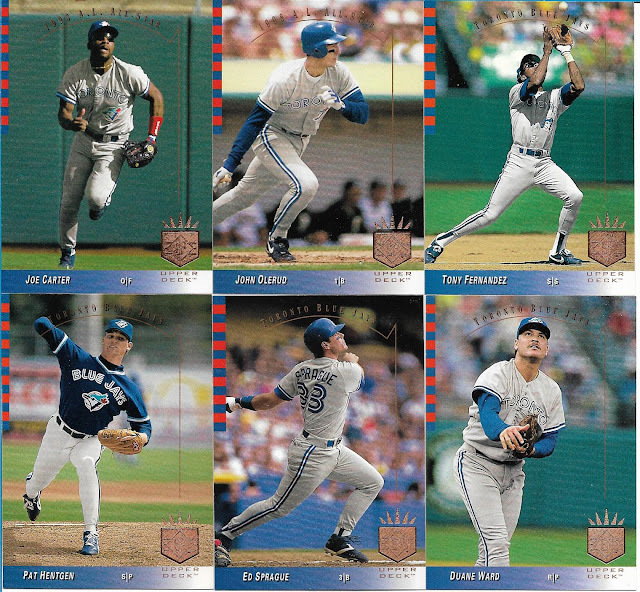 1992 Pinnacle and Bowman. Now there were more of these inside, but these were the 3 from each set I picked. 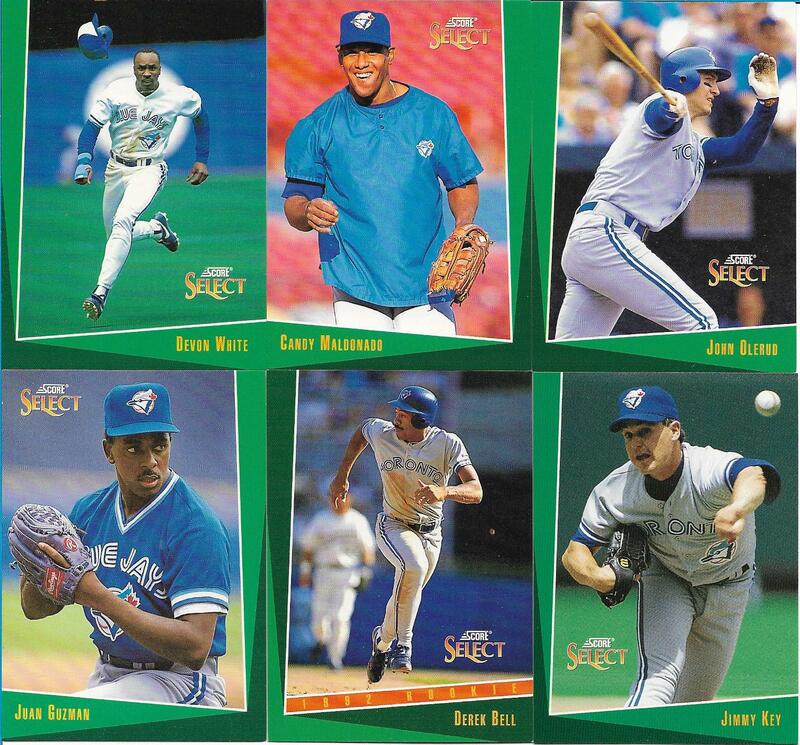 I especially like the Juan Guzman card showing him waiting for the baseball while holding up his trademark blue glove. I still remember all the hype there was in Toronto that Eddie Zosky was going to be the heir apparent to Tony Fernandez at short. Ten years and 50 major league ABs later, it just wasn't meant to be. I put these two together just because there were 4 Leaf cards and 2 Studio. Sometimes a puzzle just puts itself together. For some reason, I couldn't get the cards to sit right on the scanner bed, which is the reason for this lousy looking scan. Patience wasn't a virtue for me this evening. 1993 Score. There were 8 cards from this set in the envelope, and I was intrigued by the World Series Highlights cards, thinking that they were inserts. Surprise to me, they were part of the base set. I knocked off these cards and still need 10 more to complete the team set. Just how damn big was '93 Score? 1993 Score Select. That's a lot of green, and a lot of geometry going on in the borders as well. 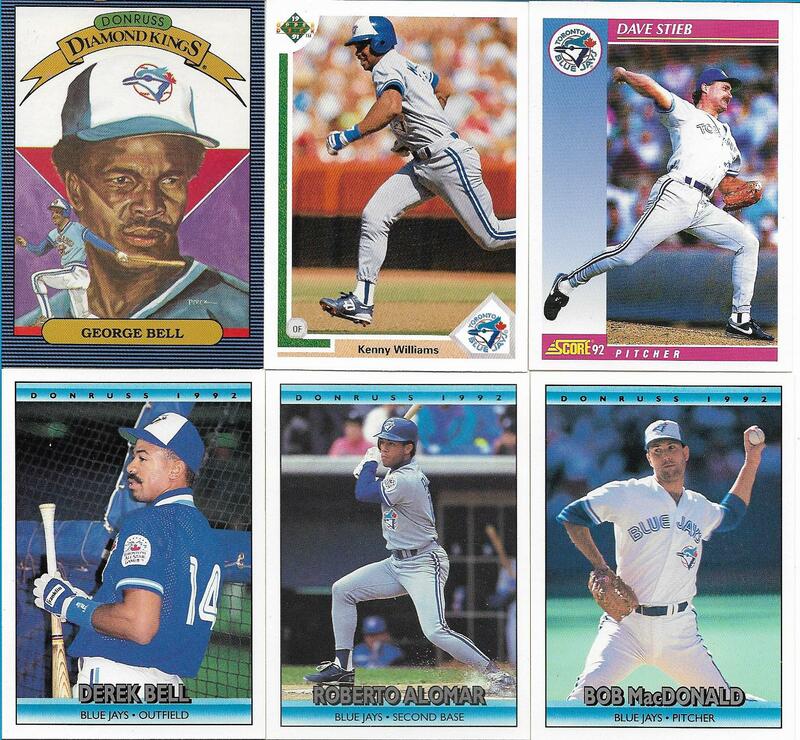 One of these days, I'm going to go through all of Devon White's cards as a Jay and figure out how many of them feature flying bats, helmets, etc. There's a few of them to be sure. The last picture features the 4 sets that Kyle managed to finish off, mercifully. 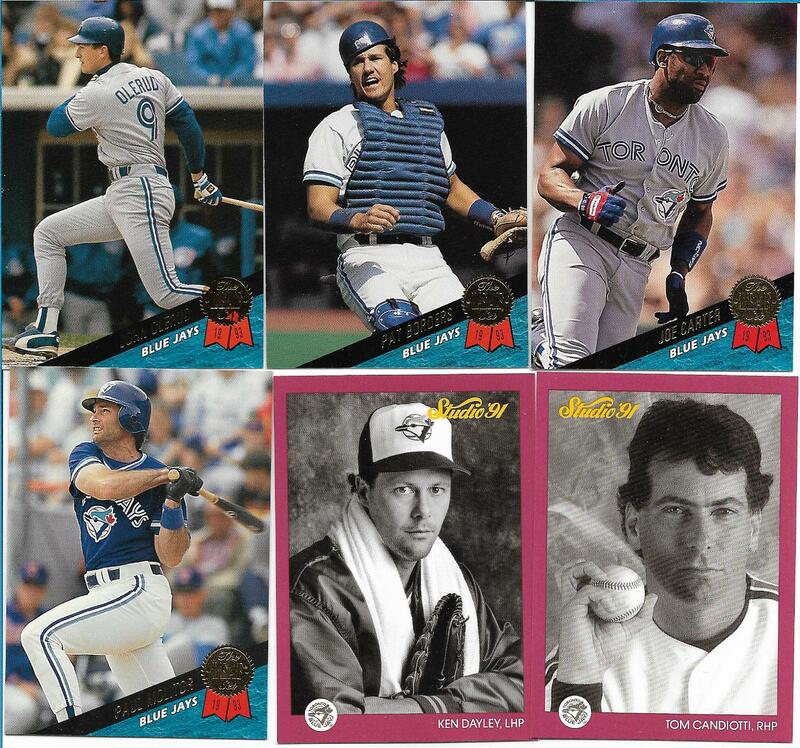 How did I not have all of the '91 UD, '92 Score or Donruss cards. Weren't there like a billion printed of each to be distributed? The George Bell DK is from 1986, and the drawing for me represents how I always thought of George. That intense stare, the competitive fire that made him the heart of the Jays batting order during the mid to late 80's. I did not know that he was traded from the North side of Chicago to the South side for Sammy Sosa. George had one OK season with the Sox, but I would say that the Cubbies got the better of that deal. Kyle, thank you very much for the trade, the cards are great and much appreciated!! '93 Score is an underrated set. I too would agree that the Cubs got the better end of that deal! "Come on Pat, throw the ball already so you can start focusing on it" lol, I would not have noticed that they're almost all looking up at the ball. Good eye! 93 SP is an all-time great set. Everyone talks about the Jeter RC but those were some great looking cards. I thought I had seen thousands of 93 Score cards but I don't recognize the World Series highlights. Maybe I had more football and hockey than baseball. Nice six-packs. No Topps though? Or do you have those already? I'm still working on completing 92 Donruss.